Three and a half minutes is all it takes for a better-for-you dessert! 1. In a medium bowl, add almond flour, baking powder, baking cocoa, and coconut sugar. Stir to combine. Add almond milk, egg, vanilla extract, almond butter and a pinch of salt. Whisk until incorporated and batter is smooth. Lightly coat inside of mug with spray and pour batter into mug. 2. 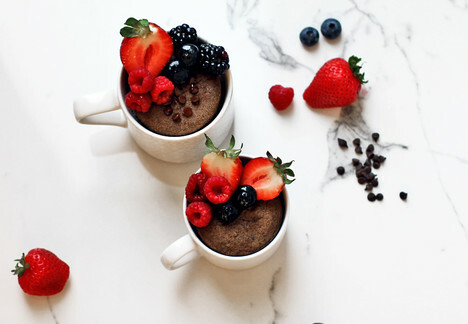 Microwave mug cake for 1 minute and 30 seconds. Sprinkle mini morsels on top.